Entertainment Weekly's takeover of the Sunset Tower hotel for a pre-Emmy bash was the hottest party in town on Friday night -- literally. 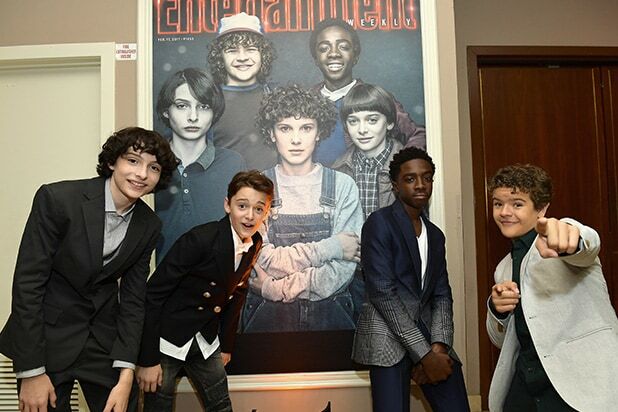 Sweaty brows cooled off poolside, while the year's top TV names swilled cocktails together... except for these "Stranger Things" guys. They're not old enough. Sarah Hyland and Nolan Gould (one of the nicest and smartest guys in TV) have the sister-brother dynamic down after 9 years working together on "Modern Family." 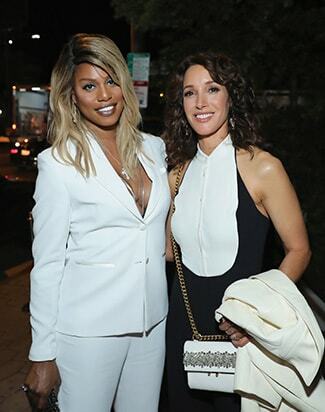 LGBT Icons Alert: Laverne Cox and Jennifer Beals arrive to the Sunset Tower. With "Orange Is the New Black" out of the main Emmy races this year, the absence of their humongous and festive cast on the party scene is noticeable. Gersh had a great turnout at their party in Westwood. Here, Courtney B. Vance, Angela Bassett and Chris Noth buddied up in Leslie and Steven Siebert's backyard. More on this bash later. Meanwhile, Demi Lovato brought a hint of Grammy weekend to Emmy weekend. The top 50 fans who stream her the most on Spotify were invited to a secret show with the "Tell Me You Love Me" singer at RVCC downtown. Back at the Sunset Tower, the "black-ish" guys did not coordinate their facial expressions for this family photo. Miles Brown wins the spirit award. More family love: Evan Ross and Tracee Ellis Ross. Hillary Duff (right, with Sophia Bush) is not "coming off the sidelines." She's been starring in Darren Star's popular "Younger" on TV Land for the past few years. Joe Keery of "Stranger Things" is ready to shoot Oxford Street fashion billboards. Check out that hair and suit combo. "Lethal Weapon" stars Jonathan Fernandez and Abigail Spencer on the Sunset Terrace, where Michelle Pesce spun '90s hip hop like DMX and Naughty by Nature. Seth Meyers hung on the patio going casual in a flannel. Many made the trek from West Hollywood to Westwood for the Gersh party at the Sieberts' home. Mandy Moore is the belle of the Emmy ball this year with "This Is Us" being the biggest breakout on network TV. At right, Judith Light ("Transparent") and Cheyenne Jackson (from the upcoming "American Woman") at the Tequila Don Julio hosted bash. Kasia Ostlun, Jeffrey Tambor and the everlasting "Mr. Big," Chris Noth. No NBCU party this year? No problem. Bob Greenblatt, Debra Messing and Jennifer Salke celebrate at Gersh. Elizabeth Olsen crafted one of the standout performances of the year, but in film. Her portrayal of a vapid Instagram star in "Ingrid Goes West" will endure long after the Instagram-era has faded. Kate Walsh and Allison Janney snap one of the top pics of the night, one that should land them in the celebrity weeklies. At right, Andie MacDowell poses with Diane Warren. Shark Damon John hung out with Heather Tara, Susan Gersh and David Gersh. "Not Penny's Boat!" Great to see you, Sonya Walger. Horror maestro Jason Blum with the hosts who opened their home: Leslie and Steven Siebert. Twenty-five years after her "Melrose Place" breakthrough, Marcia Cross remains a fixture. That's her husband, Tom Mahoney, on the right. Not since "Miami Vice" has NBC had a show with enough heat to generate a successful soundtrack release. Universal Music celebrated the release of "This is US (Music from the Series)" with a party at Clutch in Venice on Sept. 13. Pictured (from left): Jon Huertas (Miguel on “This Is Us” and co-owner of Clutch); Siddhartha Khosla (“This Is Us” composer/musician); Chris Sullivan (Toby on “This Is Us”) and Jennifer Pyken (“This Is Us” music supervisor). Earlier in the week, Paradigm chief Sam Gores toasted the Duffer Brothers and the success of "Stranger Things" at his home. From left, Ross Duffer, Christopher Smith, Matt Duffer, Mark Ross and Gores. The crowd included Shawn Levy, Jason Blum, Toby Emmerich, James Van Der Beek (riding high with the Vice comedy "What Would Diplo Do?") and 2017 Emmy winner for casting "Stranger Things," Carmen Cuba. Anglophilia gone wild: Betsy Brandt, Kate Flannery, and Matt Walsh slip in to character at BAFTA LA’s TV Tea at the Beverly Hilton on Saturday afternoon. Gerald McRaney (“This is Us”) already won his Emmy at the Creative Arts awards last weekend. The side perks: Hitting the TV tea with Gugu Mbatha-Raw and Princess Diana’s brother Charles, the 9th Earl of Spencer.